“Expand, grow, consolidate and let us join the Big Boys!”—that is the mantra that Indian policy makers (politicians and their advisors) have been chanting for over 20 years now. They have been telling us that unbridled growth, urbanisation and deserting rural landscapes are the only way out of poverty. The reality on the ground though, is that all this only adds up to more malnutrition, unemployment, greater deprivation, violence, debt-ridden rural families, a fractured education system and regressive governance. 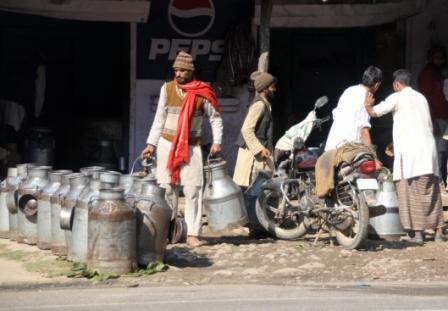 The latest casualty of such an environment is the Indian dairy sector—which had been touted as liberalised India’s “sunshine sector”. While our mainstream news reporters and political spokespersons are distracting us with their shenanigans, there is a massive milk crisis unfolding in the country. One that is threatening to destroy (for the first time), the “informal sector”-dominated resilient Indian milk market. Today, India is the world's largest producer and consumer of milk and its backbone are the millions of small dairy farmers across the country. The domestic dairy sector, even today, is dominated by what is termed the “informal market”, which is really the people's market built by small farmers, milk vendors and cooperatives. A vibrant market built on experiential knowledge and resilient local cycles of production and consumption. However as the government’s chant of “bigger is better” grows more and more strident, this resilient sector is facing a grave crisis. Research shows that the crisis is global. Small farmers in the European Union (EU), United Kingdom (UK) and the United States (US) were suffering the same fate. The crux of the crisis in India and globally is—the price at which milk is being procured by dairy processors from small farmers is much lower than the cost of production of one litre of milk. This is driving farmers deeper and deeper into debt. This is in spite of the fact that farmers in the EU, UK and US have tremendous government support. In India, there is no safety net for these small farmers. Neither Central nor state governments have taken any serious action to protect small farmer livelihoods since the onset of the crisis. We at the Food Sovereignty Alliance were first alerted in May, 2015 by our member farmer sanghas from Chittoor in Andhra Pradesh and Medak in Telangana. As we tried to understand the depths of the disaster, it rapidly emerged that this is not just a catastrophe for small dairy farmers in Andhra Pradesh and Telangana but one that is engulfing farmers across the country and the globe. In the UK and Europe, mainstream media is highlighting this as a global dairy crisis and some are even saying that “the crisis is too important to be left to the market.” To quote a recent piece from The Guardian (August 12, 2015), “Being at the whim of the world’s commodity markets means a farmer in Cheshire is vulnerable to a fall in demand from China, and Russia’s ban on EU food imports in retaliation for Brussels-imposed sanctions”. This is increasingly becoming India's reality too —a farmer in Chittoor is becoming vulnerable to a fall in global skimmed milk prices triggered by China and Russia's import bans or by Europe's lifting of the milk quota and dumping of excess dairy products through free trade agreements. India's dairy sector, unlike that in the EU, UK and US, was and is dominated by the “people's market”. This made it resilient, providing an assured source of livelihood for small dairy farmers. As the government aggressively tries to integrate the sector into the global market, lives and livelihoods of these small farmers are becoming increasingly vulnerable. If India continues on this course, small farmers will be destroyed. This is extremely serious given the agrarian distress that the country is facing. In a scenario where livelihoods based on agriculture are becoming unpredictable due to erratic weather patterns, dairying is the one hope for these small farmers. In an effort to bring attention to this crisis and chalk out a strategy for a way forward, the Food Sovereignty Alliance convened a dialogue of farmers' groups on October 21, 2015 at Chennai. Farmers' groups from Tamil Nadu, Karnataka, Andhra Pradesh, Telangana, representatives of the South Indian Coordination Committee of Farmers' Movements and the Bharatiya Kisan Union participated in the dialogue. Details of the dialogue and proposed next actions are available at the Food Sovereignty Alliance's blog. This crisis is not for the farmers alone. It is our crisis. All of us, as global citizens, must begin to ask ourselves at least a few questions: Where does our food come from? Are we drinking real milk? What goes into producing our food—vegetables, fruit, milk, meat, eggs, fish? Who makes it possible for us to eat? If we don't, then we will be party to the destruction of lives and livelihoods of these small farmers and then, where will our food come from? Is there a follow up article on the meeting on October 21? I would be very interested to read it. Milk is a highly perishable item and I wonder if the meeting discussed local distribution centers and maybe even helping farmers to produce value-added, less perishable items such as cheese, khoya and whey powder. Also it seems today that single commodity farmers, like single stock-holders, are much more at the mercy of vagaries in supply and demand. If farmers could diversify their holdings to perhaps chicken and egg production, honeybee rearing, goat milk - all of which do not require a huge outlay of capital, they will be a little better insulated from factory farming.